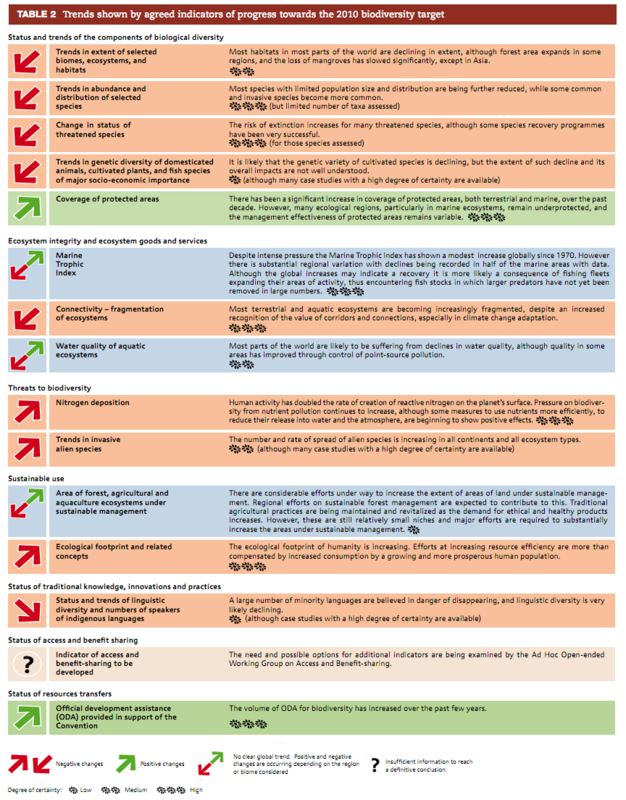 The 2010 biodiversity target has not been met at the global level. None of the twenty-one sub-targets accompanying the overall target of significantly reducing the rate of biodiversity loss by 2010 can be said definitively to have been achieved globally, although some have been partially or locally achieved. Despite an increase in conservation efforts, the state of biodiversity continues to decline, according to most indicators, largely because the pressures on biodiversity continue to increase. There is no indication of a significant reduction in the rate of decline in biodiversity, nor of a significant reduction in pressures upon it. However, negative trends have been slowed or reversed in some ecosystems. There are several indications that responses to biodiversity loss are increasing and improving, although not yet on a scale sufficient to affect overall negative trends in the state of biodiversity or the pressures upon it. The word biodiversity, a contraction of the synonymous phrase 'biological diversity', is defined by the Convention on Biological Diversity (CBD) as 'the variability among living organisms from all sources including, inter alia, terrestrial, marine and other aquatic ecosystems and the ecological complexes of which they are part; this includes diversity within species, between species and of ecosystems'. This is the definition used throughout this document. "The conservation of biological diversity, the sustainable use of its components and the fair and equitable sharing of the benefits arising out of the utilization of genetic resources, including by appropriate access to genetic resources and by appropriate transfer of relevant technologies, taking into account all rights over those resources and to technologies, and by appropriate funding." There are currently 193 Parties to the Convention (192 countries and the European Union). In April 2002, the Parties to the Convention committed themselves to achieve by 2010 a significant reduction of the current rate of biodiversity loss at the global, regional and national level as a contribution to poverty alleviation and to the benefit of all life on Earth. This target was subsequently endorsed by the World Summit on Sustainable Development (the "Rio + 10" summit) in Johannesburg, 2002, and by the United Nations General Assembly. It was also incorporated as a new target under one of the Millennium Development Goals - Ensure Environmental Sustainability. The 2010 biodiversity target is therefore a commitment from all governments, including those not party to the CBD. None of the 21 subsidiary targets to the 2010 Biodiversity Target can be said to have been completely achieved. However, substantial regional and local progress has been made towards some of them, including those related to the conservation of ecosystems, habitats and biomes, the conservation of genetic diversity and reducing the impacts of pollution. Over 170 countries (87% of the Parties to the Convention) have developed national biodiversity strategies and action plans (NBSAPs). A further 14 Parties are preparing them, and 9 have either not started to draw up a strategy or had not announced their intention to do so by the time this Outlook went to press. An overwhelming majority of governments, in other words, have been through the process of codifying their approach to protecting the biodiversity within their own territory. In many countries, the preparation of strategies has stimulated the development of additional laws and programmes, and spurred action on a broad range of issues, including: the eradication or control of alien invasive species; using biodiversity sustainably; the protection of traditional knowledge and rules to ensure local communities share benefits from bio-prospecting which might result in patents or sales of new drugs, foods or cosmetics; the safe use of biotechnology; and maintaining the diversity of plants and animals used in agriculture. Relatively few Parties have fully integrated the 2010 biodiversity target into their national strategies. Moreover, few countries are using NBSAPs as effective tools for integrating biodiversity into broader national strategies, policies and planning processes. More than 80% of Parties, in their latest national reports to the CBD, concede that limited biodiversity mainstreaming, fragmented decision making and/or limited communication among government ministries or sectors is a challenge to meeting the goals of the Convention. However, recently developed and updated national biodiversity strategies tend to be more strategic than the first generation of NBSAPs, they have a stronger emphasis on mainstreaming, and give greater recognition to broader national development objectives. Mainstreaming – biodiversity will be best protected if it is a significant factor in decisions made across a wide range of sectors, departments and economic activities, systems for planning the use of land, freshwater and sea areas (spatial planning), and policies to reduce poverty and adapt to climate change. Communication and involvement – strategies will only be effective if they genuinely involve the people closest to the resources they are designed to protect. Often the best solutions will be driven by local demand, using legal and institutional frameworks set at a higher level. Tools for implementation – particular approaches, such as making integrated decisions based on maintaining and improving the overall health of ecosystems, or introducing policies on payments for the use of hitherto “free” ecosystem services, can aid in the protection of biodiversity. Knowledge – for good decisions to be made, the best available information about the biodiversity of a country or region must be accessible to the right people at the right time. The Clearing-House Mechanism, a system of compiling, co-ordinating and providing access to relevant and up-to-date knowledge, is a key tool provided by the CBD framework. 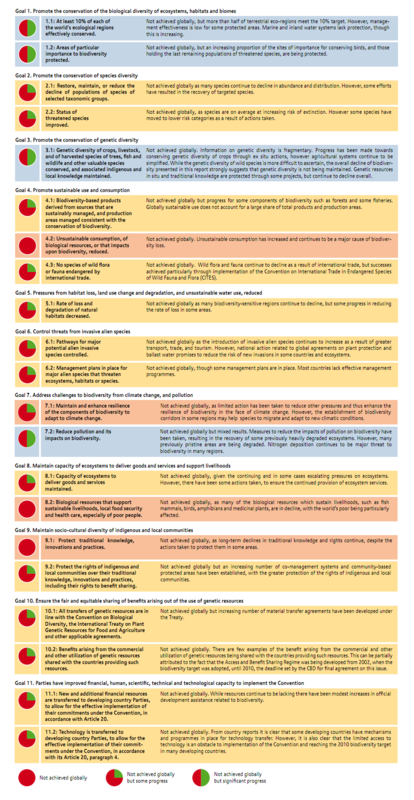 Monitoring – assessing and communicating progress towards the objectives and targets set by a biodiversity strategy is an important way to improve its effectiveness and visibility. Financing and capacity – co-ordinating action to support biodiversity will only be meaningful if there is money to do it and there are people who know how to do it. The number of countries party to the Convention on Biological Diversity has grown over time, and it currently has near universal membership. Of the 193 Parties to the Convention 170 have developed National Biodiversity Strategies and Action Plans (NBSAPs) and of these, more than 35 Parties have revised their NBSAP. Source: Secretariat of the Convention on Biological Diversity. Protected areas have been expanded in number and extent, on both land and in coastal waters. Environmental impact assessment is more widely applied with most countries reporting that they have some measures in place for its use. Most countries are also undertaking activities related to communication, education and public awareness as well biodiversity monitoring, research and the development of databases. At the international level, financial resources have been mobilized and progress has been made in developing mechanisms for research, monitoring and scientific assessment of biodiversity. 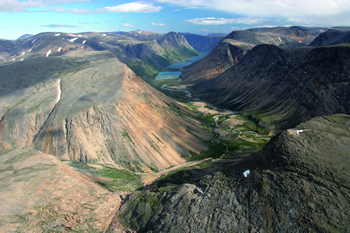 The Torngat Mountains National Park of Canada, which is co-managed with the Labrador and Nunavik Inuit, is the 42nd national park to be established in the country. The park is located at the northern tip of Labrador and covers approximately 9,700 square kilometres of arctic ecosystems. Yet, for certain indicators the amount and coverage of data is not sufficient to make statements with confidence. 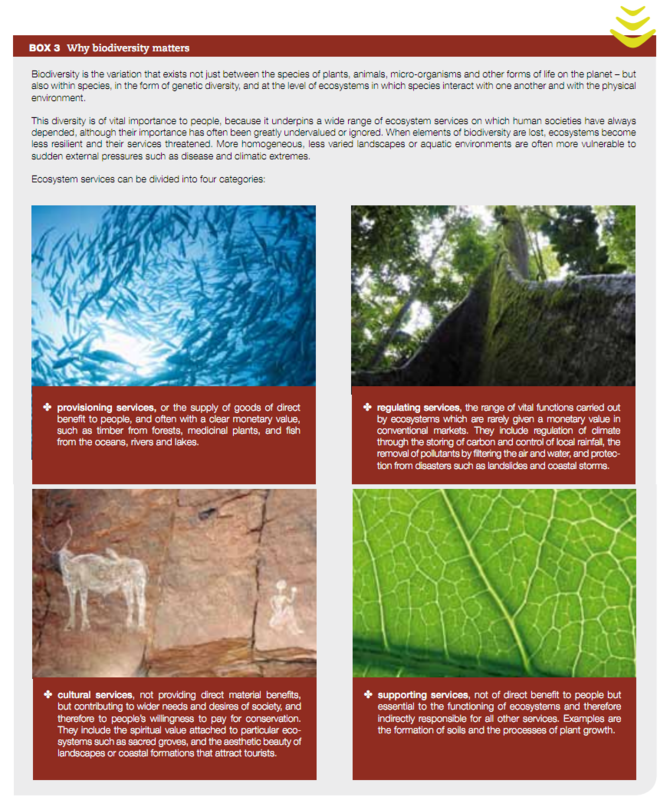 The assessment of status and trends of biodiversity on the following pages therefore relies on multiple lines of evidence, including scientific literature and recent assessments, as well as national reports from the Parties to the Convention. Not a single government in the latest reports submitted to the CBD claims that the 2010 biodiversity target has been completely met at the national level. Around one in five governments state explicitly that they have missed the target. Although the evidence does not show a significant decline in the rate of biodiversity loss, some interventions have had a measurable, positive impact by making the decline less severe than it would otherwise have been. For example, it is estimated that 31 bird species, out of a total of some 9,800, would have become extinct in the absence of conservation actions. Biodiversity is the variation that exists not just between the species of plants, animals, micro-organisms and other forms of life on the planet – but also within species, in the form of genetic diversity, and at the level of ecosystems in which species interact with one another and with the physical environment. This diversity is of vital importance to people, because it underpins a wide range of ecosystem services on which human societies have always depended, although their importance has often been greatly undervalued or ignored. When elements of biodiversity are lost, ecosystems become less resilient and their services threatened. More homogeneous, less varied landscapes or aquatic environments are often more vulnerable to sudden external pressures such as disease and climatic extremes. regulating services, the range of vital functions carried out by ecosystems which are rarely given a monetary value in conventional markets. They include regulation of climate through the storing of carbon and control of local rainfall, the removal of pollutants by filtering the air and water, and protection from disasters such as landslides and coastal storms. cultural services, not providing direct material benefits, but contributing to wider needs and desires of society, and therefore to people’s willingness to pay for conservation. They include the spiritual value attached to particular ecosystems such as sacred groves, and the aesthetic beauty of landscapes or coastal formations that attract tourists. supporting services, not of direct benefit to people but essential to the functioning of ecosystems and therefore indirectly responsible for all other services. Examples are the formation of soils and the processes of plant growth. The loss of biodiversity (at the genetic, species and ecosystem levels) also affects human health in many ways. Projections of the impacts of continued biodiversity loss, some associated costs and how they might be avoided, are outlined in this synthesis. First, the current status and trends of biodiversity, the pressures upon it and responses to its loss are described in more detail. Coastal ecosystems, as well as supporting a wide range of species, often provide vital barriers that protect human communities from the full force of onshore waves and storms.